No one understands the importance of the United Service Organizations of North Carolina (USO of NC) better than Cedric King. Cedric served in the U.S. Army for 20 years – including three combat tours in Iraq and Afghanistan — before retiring last year. While completing a standard foot patrol one morning in Afghanistan in 2012, Cedric stepped on the pressure plate of an IED. 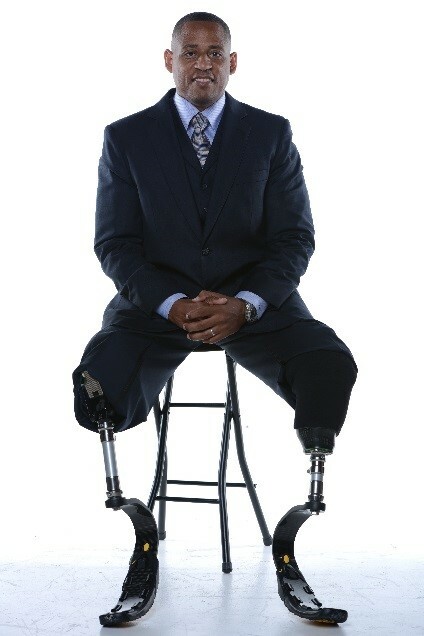 The ensuing blast resulted in the loss of both of his legs and part of an arm. Cedric’s family moved from North Carolina to the Walter Reed Army Medical Center in Bethesda, Maryland, to be with him during the recovery. The move was especially hard on his young daughters. It didn’t help that there wasn’t much for them to do until Cedric discovered they were building a USO center at Walter Reed. It hosted Super Bowl parties and acting lessons. Even celebrities made visits. His daughters enjoyed being at the center and meeting other people. As Cedric described: “It’s basically a community center on hospital grounds and it’s fantastic!” It helped alleviate some of his guilt for feeling like his injury took away part of his daughters’ childhoods. “The USO of NC is really about making the service member’s life a little better,” Cedric said. With seven military installations across the state, North Carolinians have a strong loyalty to the military personnel and veterans living and working here. More than 650,000 troops are served by the USO of NC every year, but the organization’s mission extends to the public as well. The USO of NC offers a wide variety of services to military members and their families. Programs such as the Photo Book and holiday meals provide some cheer to those living on bases or serving overseas. The USO of NC keeps families feeling close even during deployment by recording videos of service members reading books for their children or supporting families who are reuniting after deployment. They help fulfill emotional and physical needs by offering Reset Programs to troops and their families to teach them how to deal with a variety of issues such as stress and nutrition, substance abuse, and even financial literacy. And just like our dedicated military members, the USO of NC answers the call when help is needed. In the aftermath of Hurricane Matthew, it assisted in relief efforts. Within 4 hours of receiving a request from the NC National Guard, the USO of NC provided nearly 1,000 care packages that were airlifted by Blackhawk helicopters to soldiers and civilians in the stricken areas. For 5 days, the mobile center deployed within 24 hours to establish a center in the Guard’s primary and austere “tent city” near Lumberton and provided basic necessity items, a BBQ dinner, satellite and internet services to over 400 soldiers. 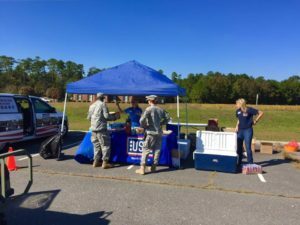 The Ft. Bragg, Jacksonville, and RDU centers delivered non-perishable food and drinks to remote National Guard locations – ensuring they remained connected to their family and homes. 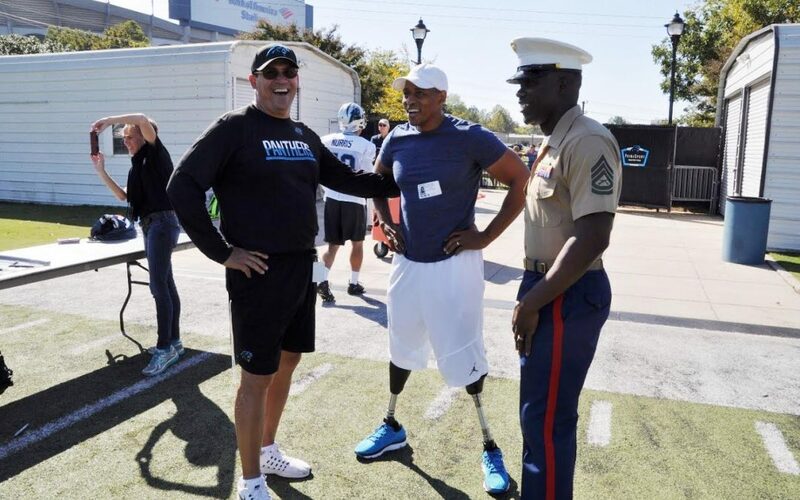 During this Month of Thanks, we offer our gratitude to the USO of NC and to the brave men and women who fuel the organization’s mission. Watch “Force Behind the Forces” for an overview of the many services the USO of North Carolina provides to our state. You will get to hear more about Cedric’s experiences with the organization. 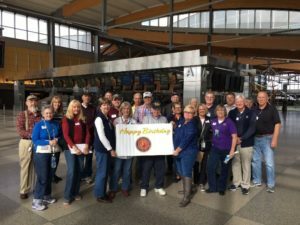 Hear more stories about how the USO of NC has served birthday cakes to single service members, acted as a place to escape for a military family with a special needs son, and helped families of the fallen. Catch “USO – For the Troops” on PBS. This 1-hour documentary shows the formation of the USO in 1941 and the impact it has had on troops and our country since then. It first aired November 7, 2016. Learn how to volunteer and support the USO of NC. As for Cedric King, you’ll be able to learn more about his own inspiring story and how to stay positive in the midst of adversity after he finishes his first book next year. The USO of North Carolina is a recipient of this year’s Blue Cross and Blue Shield of North Carolina Month of Thanks donation of $5,000. 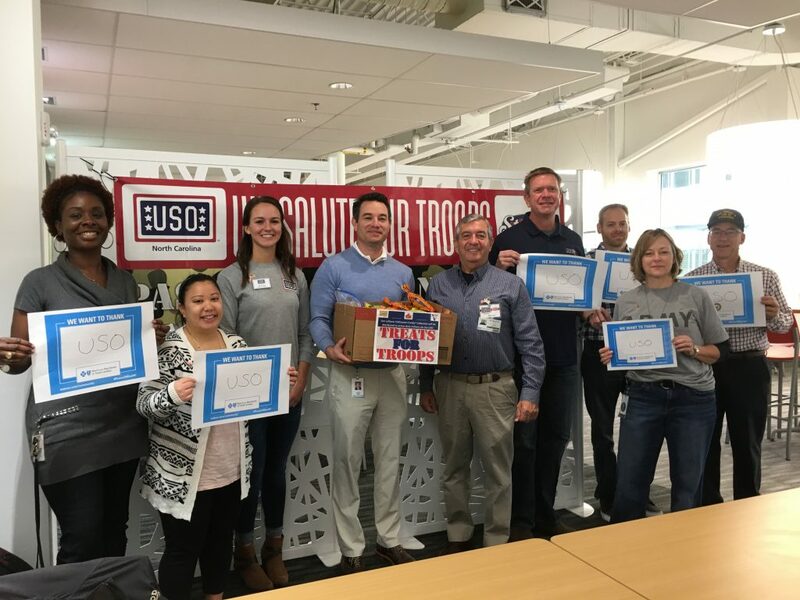 Our VetNet team members saying a big thank you to USO of NC! Courtney Hardy has always been interested in the health industry so she joined BCBSNC as a Rotational Development Program Associate in the summer of 2016. She is a North Carolina native who enjoys engaging with her community through volunteerism and supporting the robust arts and entertainment offered throughout the Triangle.